SHERPA partners gathered in Heraklion, Greece, on 21-22 November 2017 as part of the project’s third steering committee meeting to discuss the project’s progress and upcoming steps. A meeting with Cretan municipalities was also organised during the gathering to raise awareness of the project and pave the way for its transferring phase. SHERPA’s 3rd Steering Committee was held on 21 November 2017 at the invitation of the Crete Region. The aim of this internal meeting was to discuss the project’s first outcomes of the project, especially the testing activities. It also offered the opportunity to start preparation for the transferring phase, due to begin in June next year, and to discuss communication issues, as well as collaboration opportunities with other relevant projects and Euro-Mediterranean initiatives. George Alexakis, Vice-Governor of Crete, in charge of European and International Issues and Vice-President of the CPMR in charge of Maritime Affairs, opened the meeting and said that his Region is very much committed to energy efficiency in public buildings. This was followed by a presentation from Xavier Martí, SHERPA’s Coordinator, on the project’s overall progress. He congratulated the whole partnership for their hard work, particularly for identifying 113 projects in which SHERPA’s methodology will be applied. 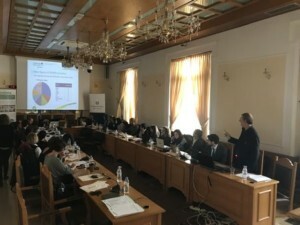 Each partner involved in WP3 activities – especially Regions implementing the energy renovation projects in their own buildings – then had the opportunity to present their work and progress. 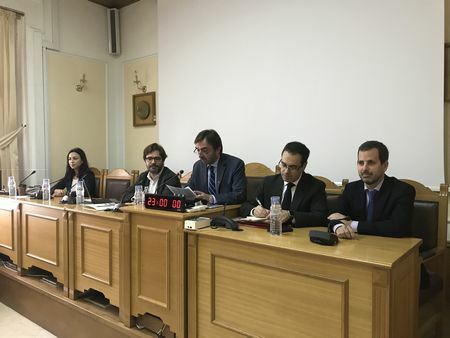 The CPMR Intermediterranean Commission (IMC), which is responsible for SHERPA’s communication and dissemination, updated the partners on the activities carried out to date, and those that are planned, including lobbying activities related to the project. Over the past few months, the IMC has pushed – through its network of contacts and its own members – for the integration of specific messages highlighting the crucial role of LRAs and multilevel governance in the implementation process of policies related to energy efficiency in buildings in important policy documents. These include the European Committee of the Regions’ Opinion ‘Energy efficiency and buildings’ dated 13 July 2017, the ITRE Committee Report ‘on the proposal for a directive of the European Parliament and of the Council amending directive 2010/31/EU on the energy performance of buildings’, as well as the IMC 2017 Campania and CPMR Helsinki 2017 Final Declarations. The second day was dedicated to side meetings directly linked to the project. It included official launch of SHERPA’s Scientific Advisory Panel, gathering one expert for each country represented in the project, which will be in charge of assessing SHERPA’s renovation projects as well as the regional strategies. On the same day, SHERPA also met with representatives from several Cretan municipalities interested in the project. This meeting will pave the way for the transferring and capitalising phases of the project, which will involve municipalities. The project’s next steering committee meeting will be held in Marseille at the end of May 2018 (date tbc). It will be organised back-to-back with a meeting of the CPMR IMC’s Task Force on Energy Renovation in Med Buildings. A meeting with French local administrations interested in the project will also take place on this occasion. 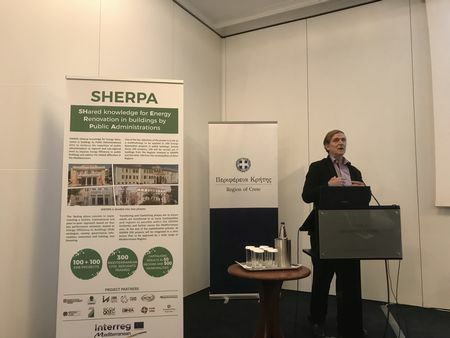 Stakeholders directly or indirectly involved in the field of energy efficiency in public buildings who are interested in becoming observers of SHERPA’s Associated Partners Forum, or who would like to be informed of the project’s latest developments, can express their interest by filling in this form.